Mr Goldberg's review of my book - judging by one quote - is in part a personal attack on me. Since it's firewalled, I canot access it (NRO has a policy of restricting their readers' access to a writer of whom they disapprove.) But Julian Sanchez has read the review in full, and has comments. One small point I would like to make. My blog is often impassioned, and throws elbows. Most blogs do. This one is actually quite civil in comparison with most. That's part of a free-wheeling debate. At its best, I think the blogosphere can sound like the British House of Commons - loud, passionate, funny and often brutal in its arguments. But we are all "honorable gentlemen and women" in parliamentary parlance. Nonetheless, I took great pains to write the book in a much different tone. It is painstakingly civil throughout and takes the arguments of my opponents seriously, and respects them. Jonah's attempt to say otherwise is simply a bid to prevent conservative readers seeing what I have to say. If Jonah cannot recognize a good faith effort to inject more reason into conservatism, to subject the disaster of the last few years to some scrutiny, then I'm sorry for his blinders. 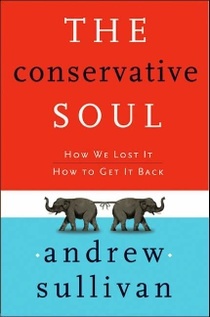 As for "shrill", I wrote a book called "The Conservative Soul: How We Lost It; How To Get It Back." The title of Jonah Goldberg's forthcoming book is "Liberal Fascism: The Totalitarian Temptation from Mussolini to Hillary Clinton."